Tamika is a Redguard commoner living in Skingrad. 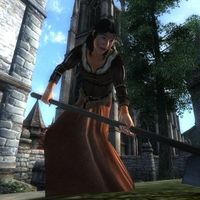 When not at home, she can usually be found working at Tamika Vineyards, one of two fine wineries in Cyrodiil. Tamika spends her life working her vineyard just outside the city walls. She sleeps from midnight to 6am in either of the beds on the top floor of her upper-class house. As long as it isn't raining, she will exit through the backdoor at 7am and plough the vineyard behind her house for four hours. At 11am, whatever the weather, she pauses for a two hour lunch break at her current location, which can either be behind or inside her house. Once she is finished, assuming it is not raining, she will travel to her vineyard in the West Weald and work it for six hours. At 7pm she will again stop whatever she is doing for a two-hour dinner, which functions the same way as her lunch break. At 9pm, if she is out in the fields, she will return to her house and wander around until her bedtime. Any other free time she has she spends inside, which is usually only for one hour in the morning unless it rains, in which case she doesn't go to work and remains inside until it stops. Tamika wears a set of middle class clothing: a brown shirt, tan linens and a pair of thick cowhide shoes. She carries a hoe, a rake, her key and some gold. Speaking to Tamika, for the first time or roughly every one in five times that you start a conversation with her, will have her greet you by identifying herself and mentioning her business; "I'm Tamika. We grow our own grapes, and make fine wines." Asking her about Skingrad will have her tell you about the local climate, and will have her boast that Skingrad's wines are the best in all of Tamriel: "Skingrad's wines are the best in Tamriel. I invite you... try them for yourself. Here, it is perfect for grapes, and perfect for wine. The sun and soil here are like my native Hammerfell, but the climate is milder, and the rainfall more reliable." Tamika is supposed to continue working her morning shift on the vineyard until 1pm, but her lunch break interrupts the AI package. Tamika has a brother, Talan, who is also a vintner. He specialises in magical brews, and can be hired to staff the wine cellar of Battlehorn Castle with the Fighter's Stronghold official plug-in installed. Tamika's pants respawn if taken from her corpse. Esta página foi modificada pela última vez à(s) 05h49min de 20 de outubro de 2015.